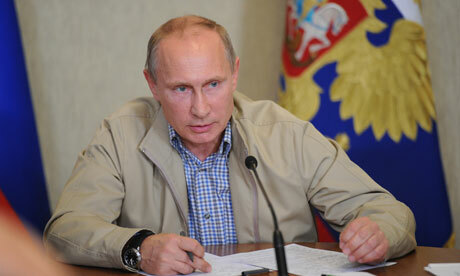 Russian Prez Vladimir Putin calls Obama’s claims “utter nonsense”, challenges present chem. attack evidence to U.N.
: Vladimir Putin has rejected US intelligence claims that Bashar al-Assad’s regime used chemical weapons in Syria, saying it would be “utter nonsense” for government troops to use such tactics in a war it was already winning. “That is why I am convinced that [the chemical attack] is nothing more than a provocation by those who want to drag other countries into the Syrian conflict, and who want to win the support of powerful members of the international arena, especially the United States,” Putin told journalists in Vladivostok. The Russian president also challenged the US to present its case for military intervention to the UN security council, after suggesting that if Barack Obama was worthy of his Nobel peace prize, he should think about the possible victims of any intervention by foreign forces. Russian foreign ministry spokesman Alexander Lukashevich said in a statement late in Friday.